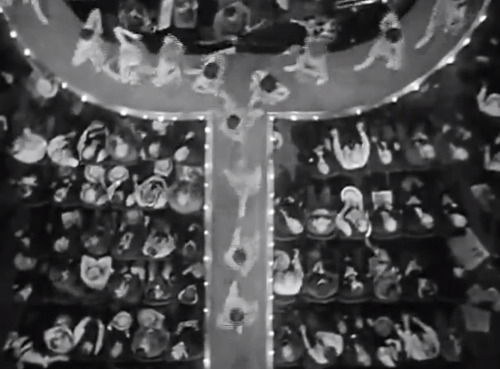 Rouben Mamoulian’s 1929 film Applause seems to have fallen through the cracks of film history. Released in a year when many of the best films still were, at least partially, silent films (GW Pabst’s pair of masterpieces with Louise Brooks Pandora’s Box and Diary of a Lost Girl (made in Germany), Dziga Vertov’s experimental documentary The Man with a Movie Camera (the USSR), Yasujiro Ozu’s Days of Youth (Japan) and Luis Buñuel’s Un chien andalou (France)), Mamoulian’s film is an all-talking, all-singing, all-dancing backstage musical made shot on location in New York for Paramount Pictures. Early talkies are generally derided as a step backwards in the art of motion pictures, as stiff, stage-bound and poorly acted, the camera tied in place due to the technological restrictions of primitive microphones and with that showing none of the expressiveness of the late silent era. To some extent, that is true (the talking sequences in the otherwise masterful 1928 film Lonesome are so terrible that they function less as scenes in a movie and more as meta-commentary on the pointlessness of adding dialogue to cinema), what is at question is how long it took for talking pictures to get back up to speed. Other films from 1929 fulfill the cliche: the first Marx Brothers feature, Cocoanuts, is particularly leaden and clunky, while that year’s Best Picture winner, the musical The Broadway Melody is better than its reputation, but still shockingly poorly made at times (a tap dancing sequence in which the frame cuts off the actors at the ankle so as to maintain a stage-like proscenium is particularly egregious). Ernst Lubitsch’s musicals with Maurice Chevalier are some of the most charming films of the period, but his elegant classical style suffered little from the transition to sound and, from what I’ve seen at least, Lubitsch never seemed interested in using the camera in the dynamic ways that FW Murnau, Fritz Lang or Josef Von Sternberg (whose The Blue Angel, made in Germany a year later, shares much of Applause‘s mileu and attitude, but pushes the depravity that seethes under the surface to the forefront) were exploring in the late 20s. Applause offers evidence that it took far less time than is generally believed to master the technology, that the reason for the poor quality of those other films might not be the technology, but the imagination and skill of the director. Rouben Mamoulian, making his first film, uses all the tricks of the late silent era to illuminate this standard, if resolutely pre-Code, melodrama about a burlesque dancer whose convent-raised daughter finds herself getting sucked into the degenerate family business. The mise-en-scene is Expressionist-influenced: in lighting and shadows both portentous, as in the crosses that dominate the convent sequences, and abstract, as when certain male characters become black spaces, dominating Helen Morgan’s doomed showgirl Kitty; and more subtly as in the countless multiplications of Kitty’s image in pictures and posters that lie in the background of many of the sets and become increasingly dominant until the film’s final haunting and darkly ironic image. Mamoulian also makes extensive use of anti-theatrical camera movement and placement: relentlessly pushing in and out of the screen space (mimicking our attraction/repulsion to the sordid and pathetic main characters); high and low angle shots including overhead views of dance sequences that abstract the characters like a proto-Busby Berkeley; de-centering the image by focusing at key moments on the characters’ legs (for example during a sequence where the young woman April is being hit on by a number of men as she walks down the street) as well as abstracting bodies in a montage like the series of grotesque men’s faces watching Kitty’s burlesque show. 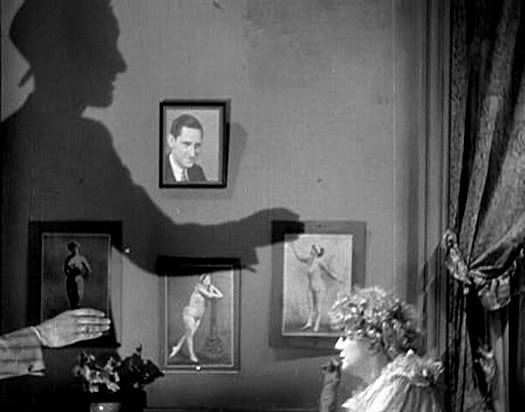 He even uses sound expressively: impressionistically like the subjective aural hallucinations Hitchcock used this same year in Blackmail (generally considered Britain’s first all-talking feature) but also in overlapping dialogue and background noise to create a densely layered sonic environment, something even the best early talkies hadn’t yet dared. With Applause, Mamoulian created a fully-realized, three-dimensional cinematic world, fully integrating sound into the cutting-edge visual styles of the late 1920s. It premiered on October 7, 1929, exactly two years and one day after The Jazz Singer.